Dictionary Challenge Week 17: Eat. Breathe. Dictionary. When you say you’re going to do something, you have to do it. And if you don’t, there are consequences and you have to pay the price. When I started this challenge I was too busy to dedicate the time it required and foolishly thought I could easily make it up later. It’s been brutal. The dictionary has taken over my life. I am not joking. I am not being facetious. I am not exaggerating. If I’m not reading it, I’m thinking about it. Every. Spare. Moment. Mostly I’m plagued by questions of am I wasting my life away with my nose in the dictionary? Will I ever make this come-back? Can I break the ten minute page and still retain things? Should I have brought the dictionary to ball to read between bats? Does anyone care or get why I am doing this? How many more hours until I’m no long behind? Am I, quite possibly, the biggest geek of them all? I can actually say thank god for my job because it gives me 8 hours of guilt-free reprieve from reading the behemoth and from thinking about it. It’s gotten to the point that if someone doesn’t talk succinctly I start to feel anxious because they’re wasting time that I could be spending with my *precious* dictionary. This is not something I feel good about. But this is the price I have to pay. I was the one who fell behind. For good reasons, but it’s still on me to deal with the consequences. I just want to say sorry to all the people out there that are suffering along with me. I promise it won’t be this way forever. I hope. This is a familiar point in every challenge I’ve ever done. It’s the point where the initial enthusiasm has worn off and I can’t rely on excitement alone to carry me through, doubt starts to creep or come crashing in, and I question the validity of what I am doing. Most people might think that at this point, it’s time to cash in those chips and walk away. I’m not one of those people that can do that. I know I won’t always succeed as I’ve learned from my last challenge and the one before that. But I won’t ever quit trying. I know to most people that reading the dictionary is odd, it’s not the same as trying to get into shape. But if it were about that, when things get tough, you don’t just walk out of the gym never to return. You buckle down and deal with it. On June 7th I hit my lowest point: behind by 242 pages. Since then I have been reading this thing every morning before work… over every noon hour break… after work… in the evenings… on the weekends… in the car… on the couch… at the table… in my home office… in the park… in bed… on the porch… on park benches… everywhere… all the time. I have only made a 54 page comeback in that time. This past week I read 61 pages. Almost double my weekly quota. And it took everything I had. My eyes are red, my head actually hurts, and… I now know that deep-six originally meant bury at sea. Which is what I sometimes feel like doing with the dictionary. But, you know, I’m an obstinate thing and I’ve dedicated myself to the dictionary. Dedicate, if you don’t know, means devote (oneself) to a noble task or purpose. So maybe that was a catachresis (an incorrect use of words) because I don’t know how noble reading the dictionary really is. Enough of this, though. Because all that reading means I have a lot of awesome things I feel I need to talk about. First up… the action of throwing (especially a person) out of a window has a word and that word is defenestration. Especially a person! I have no idea when I will ever get to use this knowledge, but I hope when the day comes… I’m ready. Now, decadence. It brings up images of gourmet food right? Sweet chocolates of marginal size and exorbitant prices? Well. It is the moral or cultural deterioration especially after a peak or culmination of achievement. I will throw you a little bit of a bone: the third sense of the word decadent is (of food) very rich or sweet [with the implication that eating it is an act of self-indulgence] So the question you have to ask yourself is… is self-indulgence a bad thing? Now one that I liked was devastating, meaning crushingly effective. That sounds pretty killer… So effective it destroyed, annihilated, crushed! But don’t think the awesome stops there. My favourite word of the week is one you’ll all know (kind of like pretty much all of the ones I’ve already mentioned) and that word is delicious. The word itself could even be considered delicious as the second sense means entertaining; very enjoyable given that I clearly have been entertained by the first sense of it. The first sense being highly delightful and enjoyable to the taste or sense of smell. Come on. You totally have to picture your personified taste buds having a discussion about a “delightful” pastry like they’re a bunch of old British ladies at high tea. You didn’t picture that? Well, I’m glad I put that image in your head. Then there is also the dawn chorus (the singing of many birds at the break of day) and cube farm (an office where the workspace is divided into cubes) and crocodile tears, meaning not giant tears, but insincere grief. 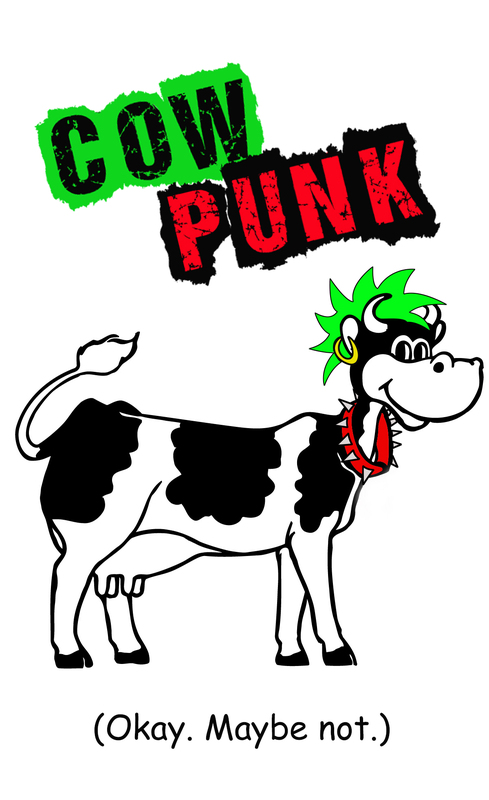 And lastly, there is cowpunk which is a cow that farmers make look punk-like by piercing their ears with jewelry and putting spiked collars around their necks. Didn’t fool you for a bit on that last one did I? Cowpunk is actually country/western music mixed with punk rock. I know. You’re thinking a genre mashup like that isn’t possible. But I’m not pulling your leg this time. That’s all for this week, folks. I really do appreciate all of you who have been here sticking it out with me. So, thanks. ← Dictionary Challenge Week 15/16: What Happened to Humanity? Thanks a lot Bill! Definitely can use the encouragement. I thought about reading the Encyclopedia Brittanica, but have always wanted to read the dictionary. The encyclopedia would certainly be more interesting, but the dictionary has it’s moments too! I knew a fellow once who spent a year (in 8th grade) reading the Encyclopedia Brittanica from A to Z. There’s no way to verify his claim, but he was not prone to exaggeration and he did possess a very wide-ranging and keen intellect, so I never doubted him. So, you go girl!